The working people of Northern Ireland, for the first time in over 40 years, have the opportunity to make their voices heard on the institution now known as the European Union. Unfortunately, the real debate has been obscured and distorted by the official “Remain” and “Leave” campaigns, each of which has sought to frighten, bully, cajole and threaten the working class. 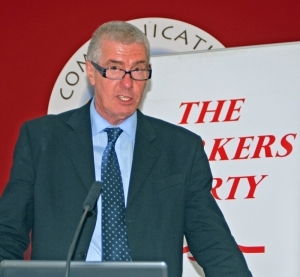 For the Workers Party the decision to call on workers to vote to leave is based on its unambiguous adherence to class politics and the principles of socialist internationalism. We reject the narrow, right-wing, national chauvinist posturing of the mainstream “Brexit” campaign.We have advanced, instead,a principled socialist case for leaving the European Union. It is impossible to ignore the class character of the EU and its institutions. It serves the interests of big business, multinational corporations and the financial institutions. The EU and its policies have made the rich richer and the poor poorer. For 40 years the EU has embarked on a coordinated programme of denationalising industries, privatising the public sector, deregulating markets, dismantling collective bargaining and eroding labour and fundamental rights. It representsan ever-deepening corporate project of austerity, privatisation, “competitiveness” and “flexibility” which results in mass unemployment and under-employment, growing poverty, increasing inequality and the destruction of public healthcare and social services. The EU and its institutions represent the capitalist project, and give primacy to promoting a pro-capital agenda at the expense of social, economic and environmental rights. It acts unashamedly in the interests of big business, imposing the harshest discipline on those European states that sought debt relief in the wake of the 2008 capitalist crisis and forcing an unrelenting programme of austerity on the working people and poor of Europe. The European Union has also become increasingly militarised. The “Common Security and Defence Policy” is a device for increasing armament production and a mechanism for political and military intervention in and beyond the EU. It has taken part in imperialist wars in Yugoslavia, Afghanistan, Iraq, Libya together with the US and NATO and has been deeply involved in creating the crisis in Ukraine. In this referendum, the US government, NATO, the multinational corporations, the banks and financial institutions, the IMF and World Bank, the rich and powerful and the European bureaucracy, which have inflicted misery on workers throughout the world, are urging voters to remain within the European Union. They do so because that is in their interests. The battle lines are now clearly drawn between those who defend such a system and those who oppose it. The Workers Party urges workers to vote in the interests of their class and their future.